During a recent trip to Oviedo Spain I took in a a match which turn out to be a local derby between Areces and FM Roller. A fast end to game with eleven goals and abuse at the refs, a great game to watch and a pleasure to see the home team win. 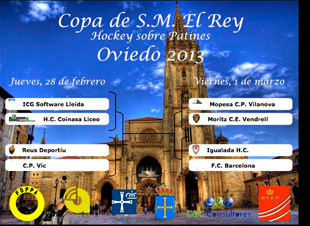 This years Copa del Rey will be hosted in Oviedo, Spain where some of the best teams in the world line up. FC Barcelona, Reus Deportiu, C P Vic, ICG Software Lleida, Coinasa Liceo, Mopesa Vilanova, Moritz Vendrell and Igualada HC. ICG Software Lleida v Coinasa Liceo starts the competition at 19.00hrs on 28th February with two matches on the Thursday, Friday and Saturday finishing Sunday with the final starting at 12.45hrs. In a cracking match in Grado near Oviedo, Areces were victors over Barcelona last weekend in their home game in the Spanish National Division one. The 2-1 win lifted them to ninth place in the league table. 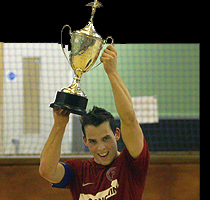 Herne Bay United will take on RHC Uri (Switzerland) in their home leg of the 2012 CERS Cup. Uri’s home Roller Hockey match took place on 10th of this month and HBU took a hit to the tune of 7-0. 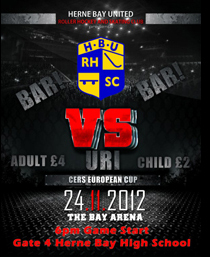 To see HBU take on the swiss team you’ll need to be at the Herne Bay Arena, Gate 4, Herne Bay High School, Bullockstone Rd, Herne Bay, CT6 7NS on Saturday 24/11/2011 starting at 6pm. We’ll be there to get all the action. 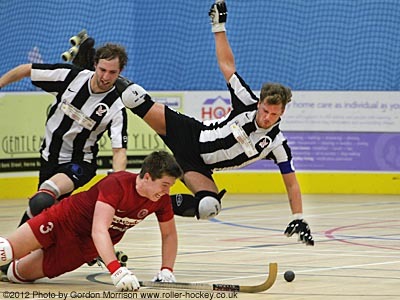 England Roller Hockey held the 2012 National Cup Final at the new rink in Herne Bay. This new rink opened late last year after the pier pavilion closed. The Senior National Cup was challenged by two northern teams this year, Grimsby RHC National League champions and runners up Middlesbrough RHC. The match had a slow start as both teams testing each other as Grimsby wanted the double and Middlesbrough needed a title this year after losing the National League to Grimsby on goal difference. The fifty minutes of play seemed even but Middlesbrough had a little more luck as Gimsbys Marc Waddingham and Captain Andrew Simm rattled the goal post on several occasions and Boro’s Owen Stewart and Sam Kay had the accuracy. The match ended with a final score of 6-3 to Middlesbrough. Its now twelve years since Ian Morrison ex Letchworth RHC player went out to Spain to play Roller Hockey, and is still playing. He currently plays for the asturian club CP Areces in the Spanish National Division 1 and has done so for the last six years. Over this time he has put his roots down and has fitted into the Spanish way of life mastering the language and traditions. Recently Ians regional newspaper wrote an article on him and the club outlining his club career and personal life which you can read the translation. In addition to this you can see Ian in the photos of Areces v CP Cerceda played last month. He came first for the Hockey then everything else followed. 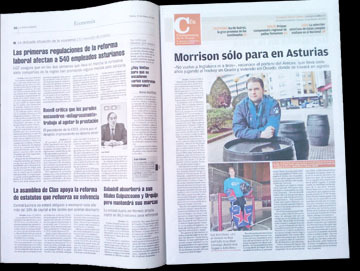 What can we say about the love story between the Englishman Ian Morrison and Spain. 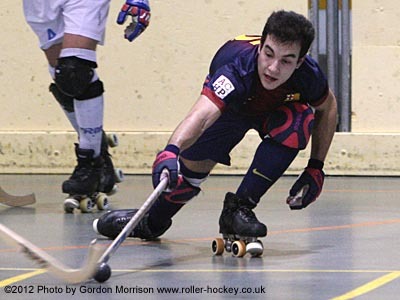 Its a passion that he shares with Arece’s as a goalkeeper and English Roller Hockey. He came to Asturias six years ago. Ian was born in 1983 in Luton, Bedfordshire. But he was 15 when his love for Roller Hockey found him in Catalan town of Vic, where he attended a Roller Hockey summer school. 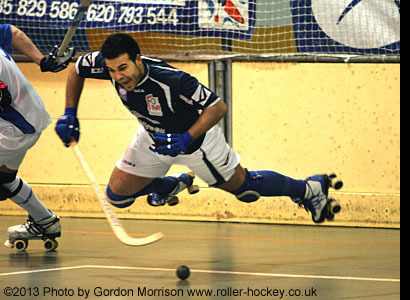 When he was 17 he was part of the first team of Vic, he also played in European Competitions for England Roller Hockey. He then joined G.E.I.E.G. in Gerona. Ian found it very hard at first being in a country where he did not know anyone or speak any Spanish. He found it very difficult in Catalonia as people had there friends and it was very difficult to become part of those groups. But when he came to Asturias it was different people were much easier to make friends with. Ian then signed up for a Team in San Sebastian, a beautiful city but the level of hockey was quite low. It was there that he met an Asturian girl whom he is to marry in August 2012. Everything seem to come together and he found himself living in Asturias. The level of roller hockey was of a high standard and his future wife was here. Ian said this whilst sipping a beer in a bar in his neighbourhood Florida, Oviedo. It has been a long time and Ian now feels Oviedo is more like home, where he has many friends, a job and a wife to be. He does not think he will return to England even in death. After 12 years in Spain he has lost touch with friends and feels his life now is in Oviedo where he teaches in San Ignacio & Santa Teresa School. He also tutors students and last summer started a small business to bring some of his students to England to improve there level of English. 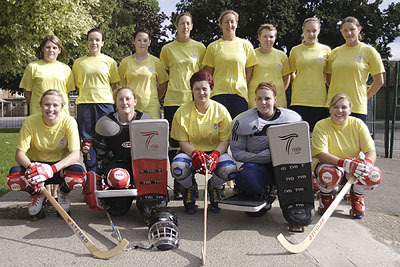 The England ladies team will be travelling to Alcobendas (north of Madrid) at the end of this week to compete in the 10th Ladies World Roller Hockey Championships from 25th September to 2nd October. The sixteen teams competing are from Germany, Argentina, Australia, Brazil, Chile, Colombia, Spain, USA, France, India, England, Japan, Mexico, Portugal, South Africa and Switzerland. We will be covering the Championships with a small selection of pictures being added to our gallery during the competition. Carlos Amaral NRHA National Performance Director has announced the final 10 to represent England in the 2010 Under 17 European Championships in Northampton in ten days time. Congratulations to the successful players and we all wish them good luck. 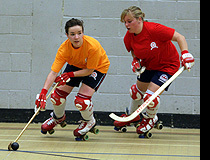 Ladies from around the country came together on Ladies day to play competitive roller hockey on Sunday 1st August. 33 players of all ages made up five teams in a round robin competition at the Bushfields Sports centre. Organised by Kirsty Ingham, Lucy Rawinson, Lucy Rivers and Michaela Parfitt the day raised money from entry fees, a raffle and a cake stall in preparation for impending World and European championships. Saturday’s National Cup Finals was a great success with Middlesbrough taking the trophy at under 20′s and Senior levels, Peterborough won the under 15′s, Bury were victors at the under 17′s, the reds winners of the ladies and Herne Bay United are under 13′s 2010 cup champions. Presentations for player of the year in each age catagory were made during the afternoon and we congratulate all the recipients of these prestigious awards.